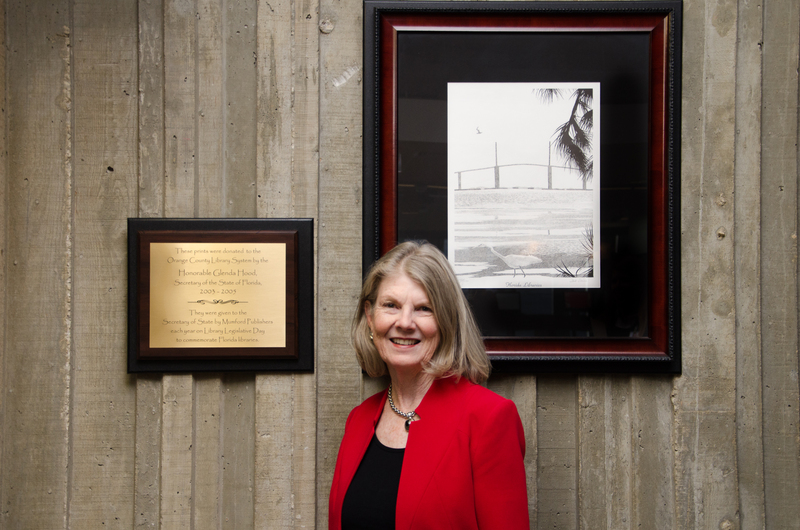 The Honorable Glenda Hood at the Orlando Public Library with the commemorative artwork she donated honoring Florida Libraries. Photo by Viviana Valencia-Serrano, October 25, 2017. These prints were donated to the Orange County Library System by the Honorable Glenda Hood, Secretary of the State of Florida, 2003-2005. They were given to the Secretary of State by Mumford Publishers each year on Library Legislative Day to commemorate Florida Libraries. Listen as The Honorable Glenda Hood describes putting in place a grants program for libraries and visiting libraries all over the state as Florida Secretary of State in this excerpt from an oral history interview with The Honorable Glenda Hood at the Orlando Public Library on October 25, 2017. I recognized when I visited libraries all over the state, and we were able to put in place a grants program for libraries and it was great to see how they were used. You know, some libraries put little cafes in place. Others were able to leverage some of those grant dollars that the state offered to get private sector contributions to do things. And certainly our own library here in Orlando has had tremendous support from the private sector to put in place significant gathering spaces where people can take classes and learn things. You know, recording studios and 3-D printing and all the things that I continue to learn about our own library. But we did an economic impact study for libraries in the state of Florida as well and that continues to be used across the state. The Honorable Glenda Evans Hood, an Orlando native, became the first female Mayor Of Orlando in 1992 and the youngest elected Mayor of Orlando. The Honorable Glenda Evans Hood served three consecutive terms as Mayor of the City of Orlando, 1992-2003. In 2003, she took on the responsibilities of Secretary of State of Florida where she served from 2003-2005. She currently serves as a Global Governing Trustee for the Urban Land Institute.